A good friend of mine recently commented that running a marathon is a spiritual experience. I can imagine that in the agony of those 42 long kilometres, I will need to get acquainted with my spiritual self and, in fact, have had to find inspiration to push on through many of my training runs. I’d like to share with you one of the great sources of that inspiration. Many of you may know Hannah’s story...and a lot of you were (are!) a key part of the story line. Hannah was born in August, 2004...19 days ahead of schedule. People say you forget your labour and delivery the minute you look at your child, but I clearly remember every single moment of it. 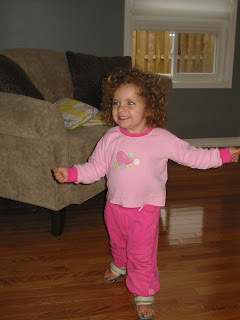 Hannah was a beautiful, happy, pudgy, baby with a head full of perfectly formed curls. I was a neurotic first-time mom...googling every wheezy sound or odd movement she made to ensure that she would survive the next 24 hours. When Hannah was 3 months old, I started to have a mom’s intuition that something wasn’t quite right. Many people kindly assured me that not every baby develops according to “What to Expect the First Year”, but Hannah wasn’t making any effort to move toward any of the first-year milestones...sitting up, rolling over, or - later - crawling. At her 3 month and 6 month Healthy Baby check-ups, I talked to our doctor who felt that it was a factor of Hannah being a big baby and that she would eventually catch up. When 1 year rolled around and Hannah was making no effort to get on her feet, I stopped accepting the Big Baby Theory and asked for a referral to a pediatrician. We saw Dr. MacGregor, an amazing pediatrician who patiently listened to all of the diagnoses that I had already made as a result of my exceptional internet research, and then politely suggested that maybe we should let a neurosurgeon do the diagnosing. Hannah was booked for an MRI and an appointment with Dr. Drake, a neurosurgeon at Sick Kids. What Dr. MacGregor had discovered in that initial exam was that Hannah’s feet did not bend at the ankles...something was pulling her lower leg muscles in both legs extremely tight, and he hypothesized that it was a neurological issue, related to either her spine or her brain. Many months, a host of doctors, and a battery of tests later, Hannah was diagnosed with cerebral palsy. It is a spectrum condition, so some children present mildly and others can face severe challenges. All we knew at the time was that it was causing Hannah’s legs not to work properly. 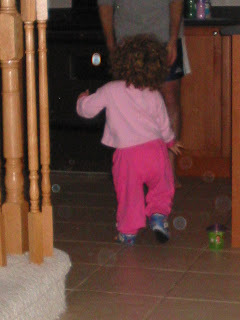 She was almost 2 and still not standing on her own. The most difficult part of all was that the doctors wanted Hannah’s treatment regimen to include regular Botox injections into the muscles in her legs. I count the Botox days among my worst as a mom. We would go into the treatment room, where they would lay Hannah face down across my lap on a little cot and then inject her 5-8 times in each leg while I restrained her. As you can imagine, she would scream to high heavens, but Hannah’s incredible resilience is one of the reasons she is an amazing gift and, once the injections were over, she would get up, wipe her tears and tell the doctors, “Thank you”. Hannah took her first steps in October, 2006 at 26 months. 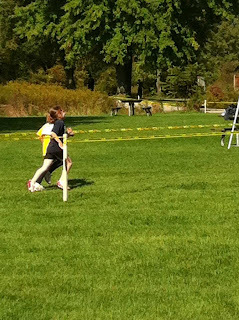 Last year, Hannah ran her first 1 km cross country race without stopping, without assistive devices, and without leg braces. She no longer needs Botox injections. I credit the power of prayer, the incredible medical support, the powerful love of our entire family, and her unbreakable spirit for how far she’s come. In those early days of uncertainty around what Hannah’s future held, so many prayed that she would be able to use those tiny pudgy legs to walk one day and I swore with everything in me that if we were given that gift, I would set an example of never, ever taking our abilities for granted. That is one of the reasons why, despite not being a natural athlete, I will run for as long as my legs will let me...and that is how I learned to be grateful for my legs. 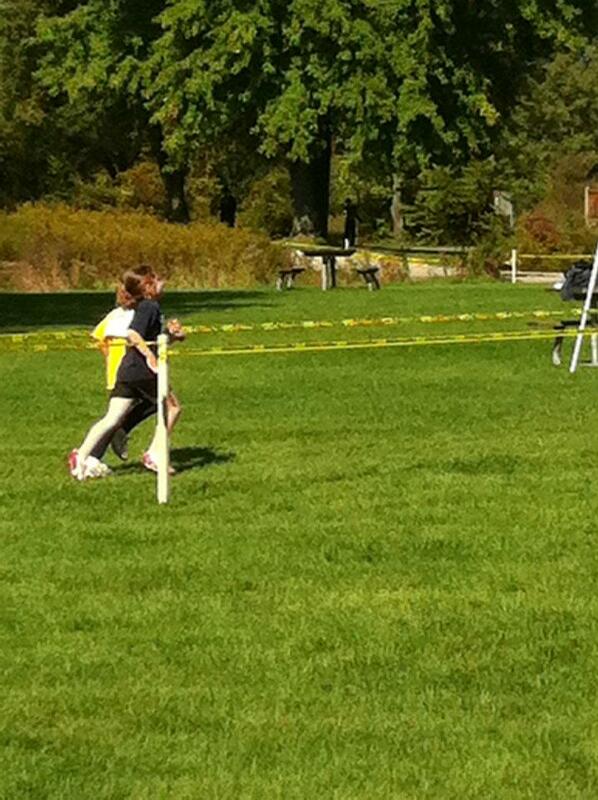 Thanks for running with me. that's amazing Corrie. Thank you so much for sharing such an inspiring story of how your daughter and you her mother were able to overcome such a difficult and challenging situation and time. I agree with you when you say: that it's prayer, faith and determination that moves us ahead. I have certainly lived my life that way as well. Thank you once again. Sincerely, Farheen K.
Thank you for the kind words, Farheen. I appreciate you taking a minute to share your thoughts (and I definitely see your determination through the work you do!). Thanks again. Thanks for the powerful reminder, Bannie. I have read an inspiring life lesson on your blog today, Corrie! How blessed you are to have a little "Miracle" living in your home :) Sue P.
Aww, jeez, Corr. Now I'm all choked up. I remember this time well and I marvel at the poised and graceful young girl Hannah is now. I hope all parents who face an unwanted diagnosis related to their child will see or somehow get the spirit of your message here. Love ya! Laughter and World Peace Network...I forgot to credit those as getting us to where we are today! :0) What haven't you supported us in over the years?! I love that you've lived this with us and have known Hannah at every stage along the way. You're awesome. Love ya. Thank you so much for such kind words. :0) I really hope we get the chance to meet again soon! Take good care and all the very best! !